The Disabled Veterans National Foundation is announcing the shipment with an estimated value of over $175,000, in specifically requested items to the Atlanta stand down event. DVNF Care Kits are always a favorite item at stand down events. 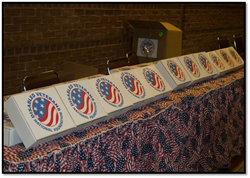 The Disabled Veterans National Foundation (DVNF) is announcing the shipment with an estimated value of over $175,000 in specifically requested items to the Atlanta stand down event for homeless veterans. The Atlanta stand down event will take place on April 9th, and is being hosted by the American Legion Mundy-Beck Post 911. In preparation for the stand down event and the 300 veterans expected to attend, DVNF responded to their request for two specific items – shoes and toiletries. DVNF fulfilled that request through its Health & Comfort program with a shipment containing 300 pairs of brand name shoes, as well as 540 of its signature care kits which contain necessities like deodorant, dental supplies, and other important toiletries. The shipment also contained an array of comfortable golf clothing which was graciously provided by DVNF’s program partner, the Salute Military Golf Association. Other items in the delivery include soaps, blankets and other useful items veterans will need. The valuable items DVNF sends to these types of events are often vital to the success of a stand down. These Health & Comfort items actually sway many veterans into coming to the stand down, and ultimately, get the help they need. DVNF staff members will be volunteering at the event to help hand out the supplies, as well as other special items these veterans will hopefully appreciate.